My grandfather died when he was 97. He was a big tall man who lived on a remote farm outside Letterkenny. He wasn't one of life's great talkers, rarely if ever initiating a conversation, only responding when asked a question. So I really never got to know him that well. Anyway, shortly before he died we were sitting around the fire and I heard the story that he had two brothers who emigrated in the early 1900's and that he had, basically, never heard of them again. One, it is believed, died in the Great 'Flu epidemic of 1918 somewhere in Canada. What happened the other, who also went to Canada, is unknown to me. I don’t think, at this stage, anyone knows very much at all. The only, very skimpy bit of information that did filter back was that a Letterkenny man called Harris, who was in a miner's camp somewhere near the American/Canadian border – near the Rockies - heard a Donegal accent and talked to the man. Years later when he came home he told my grandfather of meeting his brother; which great uncle he met is something I'm not sure of. In my youth I thought this a strange story but after a career spent in journalism I know our family was far from unique. In a long ago world where communication was a lot more difficult people could disappear without trace. And many did. Fast forward 90 or so years later to a totally different scene and I'm sitting at a party in South Australia. During the course of the evening the host told me he wanted me to meet someone. Eventually I'm introduced to this man with a strong northern accent. To cut a long story short the guy emigrated in his teenage years - in 1974 - and to this day has never been back. We sat down and chatted and the nostalgia he had for home was palpable. He told of fishing on the river Faughan the day before emigrating; of kissing his first girlfriend goodbye – she’s a granny now – and leaving behind his old school pals. When talking you could see the years falling away and he was back as a boy in his home place near Dungiven. All this was running through my mind the other day when I heard a discussion about emigration and the recession. According to statistics gathered in 2014 by the OECD about ten per cent of Irish young people emigrated in the first four years of the crisis. One of the panellists suggested austerity measures had also deprived a quarter of the workforce of jobs. I would presume a significant number of these people subsequently moved out of the country too. So in places like Sydney and Toronto etc you will, quite literally, find thousands of young Irish, hundreds of them from towns and villages across this county, people who emigrated during the recession. And they won’t be coming back. This is a subject I keep coming back to because I think the politicians and the media executives in the bubble that is Dublin 4 don’t get it, that there is, most definitely, two Irelands – the east coast where economically it’s all happening, and then there is us on the west coast where nothing is happening. How many jobs have been created in south Donegal over the past decade? How many in Inishowen? How many new schools have been built? How much has been spent on our roads in comparison to the rest of the country? Have we got a university yet? A rail service? A centre of excellence for cardiac treatment and/or cancer care? Do we have a public transport system? Answer to all those is, you have guessed it, no. What I’m trying to get around to saying is that unless we give this generation who emigrated something to come back to we’ll be repeating the same cycle as I mentioned above. When it comes to Donegal history really does repeat itself. Things have got to change. Just a couple of weeks ago we had a presidential election and there was massive surprise at the vote gathering of Peter Casey. It certainly took the intelligentsia by surprise. But it really shouldn’t have. His vote was clearly a protest vote by people who might not necessarily have liked what he was saying but liked the fact that he was bashing the cosy consensus coming out of the corridors of power, people who keep promulgating the ridiculous claim that everything is fine, that we are all on the road to recovery. 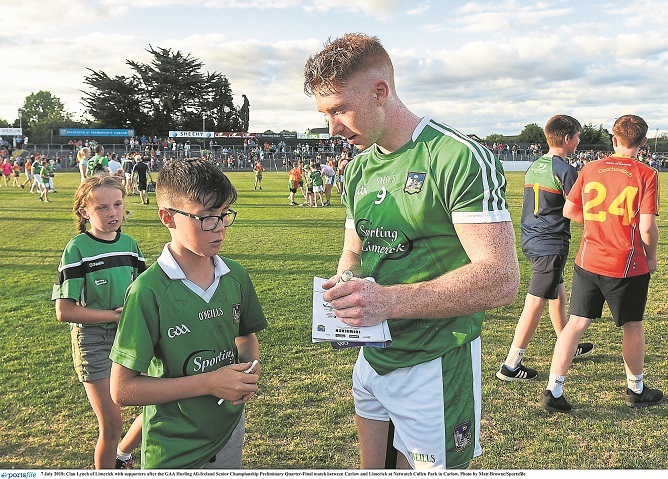 By sheer chance I caught an interview with Limerick’s Cian Lynch on RTÉ on Friday night just after he had been named ‘Hurler of the Year’. Lynch (pictured in action for Limerick) was modest, funny, self-deprecating and clearly well brought up. And the really lovely story is that when he was informed that he was going to get the Hurler of the Year award he decided not to tell his parents so that when it happened on the night it would, as it were, make their night. Last week more than 100 panes of glass were smashed in an Offaly Church of Ireland church. It was, without question, a wanton act of vandalism. While this incident was, rightly, condemned by the vast majority of people it would seem we still have some bigots amongst us, little sectarian thugs who don’t like people or communities that are different. Over the years Donegal has had its share of this kind of thing. I have knowledge of attacks on ‘non Catholic’ – for want of a better term – buildings including the burning of the Orange Hall in Newtown, a church at Quigley’s Point and, quite a long time ago, a vandalism attack on a church in Convoy. I presume this is not an inclusive list. In a world where intolerance seems to be increasingly acceptable - Brazil has just elected a leader who says torture is good, Saudi Arabia is going to get away with a blatant murder of a journalist, Trump tells American troops to shoot anyone who throws a stone at them – it looks like the thugs amongst us are gaining ground.